Win prizes, help Furkids and be a part of the World's Largest Virtual Valentine!! All submissions are entered in to daily prize pack drawings. Winners receive a $50 Petco gift card, a signed print from MUTTS, a Petco Foundation apparel item, a tote bag from BOBS/Skechers and a coupon for a bag of WholeHearted dog or cat food. PETCO GRAND PRIZE: MOST "LIKED PHOTOS"
The two entries with the most "Likes" will win a $100 Petco gift card, a MUTTS print, WholeHearted treats, a Petco Foundation apparel item, a tote from BOBS/Skechers and a bag of WholeHearted dog or cat food to the top two most "liked" photos! The entry with the most "Likes" will also receive a year of WholeHearted dog or cat food. *One lucky Furkids adopter will receive 2 free tickets to our 17th Anniversary Party ($300 value)! Simply submit your photo to enter. *If you are selected for one of the Petco prizes above, you will also receive a free Furkids t-shirt of your choosing! 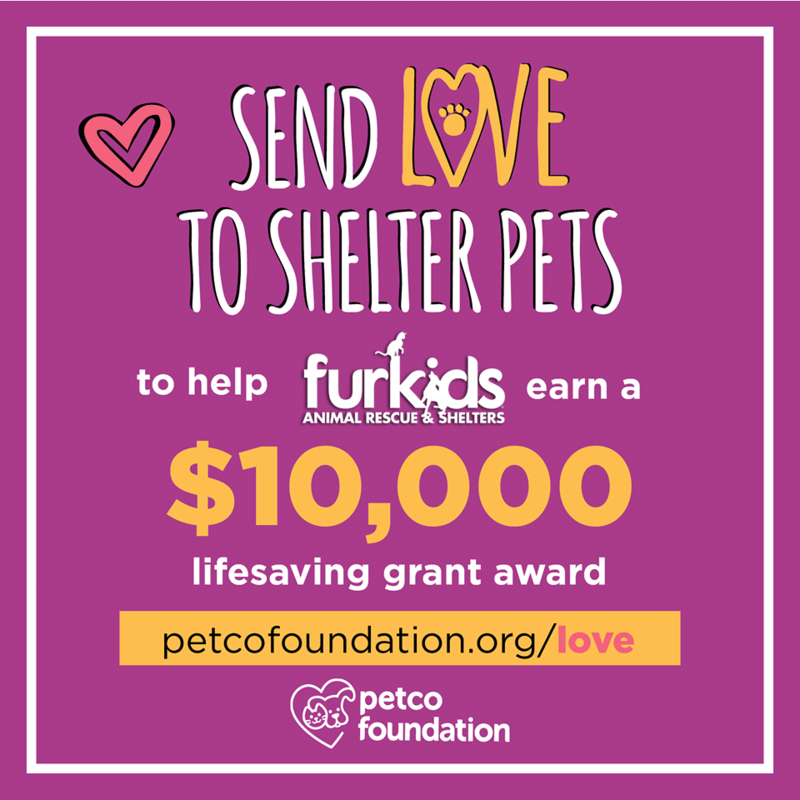 Forward your prize confirmation email from Petco to news@furkids.org claim your prize.